The culmination of nearly 8 months of training, all over in the space of a day. And what a day it was. But more about that later. 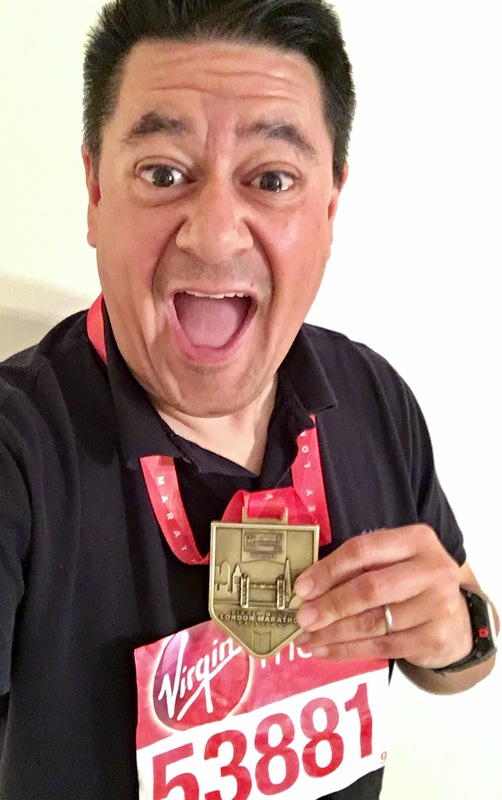 This is my last training blog as the training is, indeed, over – the London Marathon has been conquered; 26.2 miles in 5 hours 43 mins (or 6 hours 12 mins if you look at it another way – see below). This week has been a roller-coaster ride of a week though – it’s Thursday evening now and the legs, shoulders, arms have only really gotten back to normal today. But the physical stuff pales into insignificance against the emotional side – whew. 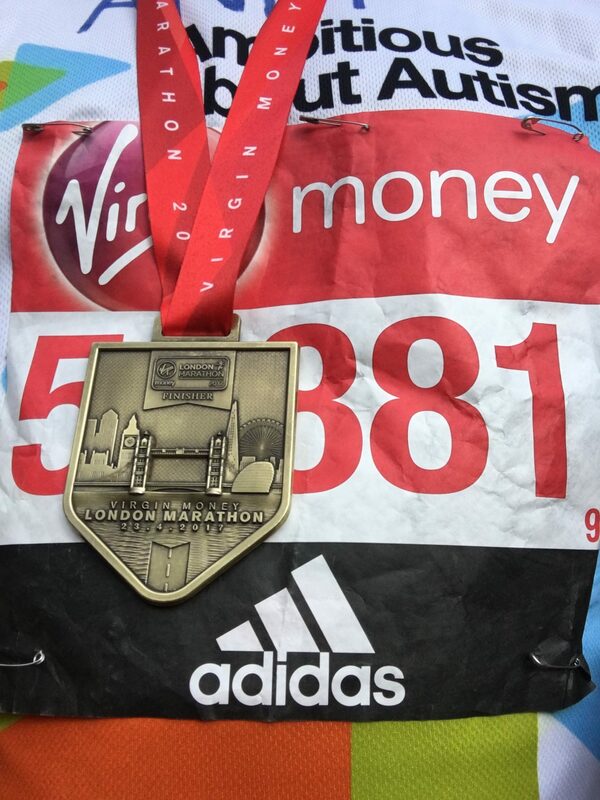 Who would have thought a jog around London could unravel so many emotions – this week has been a combination of massive pride, acute achievement, woe, sobbing in the shower and back to elation again. 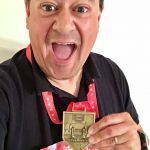 I had a chat with a psychotherapist that I know (I didn’t need therapy or anything, he works in my building) and he reckons I am in mourning: I’ve been in very tempestuous relationship with The London Marathon for 9 months, it has been there all the time in the back of my mind, has given me extreme pain and joy, has haunted my waking and sleeping hours. And now it’s gone. 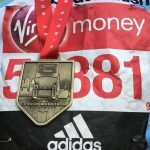 All that training – up at 6am some mornings (not many but some), all those endorphins, all those miles, all that scenery, all that achievement, and finally that one massive massive day – now all gone. About that massive day. Sunday started at 5.30 am for me. I’d done all the right things the night before – lots of protein, relaxed, a nice movie with the family, an early night. I felt good when I woke up, not too many nerves, not too tired. Shower, change, eat the breakfast of a condemned man, 2 toast and jam. The toast felt dry, the jam was tasteless, it rolled in my mouth but I forced it down, knowing that I needed to fuel. Out in the car into the cold morning air with my kit bag filled with protein bars, bananas and lucozade, to Park Lane Q-Park where we would later meet and Angela would drive me home. On the tube to Cannon Street to get the train to Greenwich – the tube was buzzing with lots of fellow participants with their kit bags and dark expressions of fear and anticipation on their faces. At Cannon Street the overground which was a much merrier place – the passengers had filtered out to mostly Marathon participants by now and the vibe was good, infectious. No-one was paying for their ticket to Greenwich today, Network Rail had covered the fare for all Marathon runners. Eventually to Greenwich Park and now in a steady stream of participants, past the cafes with people spilling out, ducking into the loos and drinking coffee and juice. We were then filtered out into runners and non-runners with runners herded into a staging area before heading to our start zones. And all of this before 0900. Meeting fellow runners and team mates, watching Gaby Logan interview newlyweds who had apparently got married that morning before running the race. By 0930 we had all deposited our kitbags into lorries (filtered by runner number) which would then be transported to The Mall. We then headed to our start areas. Great banter and chats in the start area; smells of deep heat, warm bodies, fear. Given my self-predicted time of 6 h 30 mins I was in one of the last zones, zone 9 and the atmosphere was excellent. Commentators keeping us cheering, helicopters, some real characters. And then at 1000 we were off – reaching the actual start line at 1030. I won’t go into massive detail about the run itself but here are a few highlights, things that I want to write down before they fade from memory. The slight feeling of insecurity after leaving the start zone where we were quite tightly packed, warm and comfortable then having to run (run you say? the cheek of it!). That was a shock after ages of standing and walking. Heading down through Greenwich then down to Charlton, Woolwich, along the river (nice breeze) and then back up to Greenwich and the Cutty Sark. Realising that this was a MASSIVE deal – that there were thousands of people outside pubs, lining the roads. Beer, BBQs, charcoal smoke, the smell of burgers cooking, sunshine, bands. A massive mix of areas and people, modern areas, run down areas, young people, old people, kids high-fiving, people in their Sunday best as if they were dressed for a big day out, more deprived individuals, all colours, all sizes, London together. I was proud to be a Londoner that day. 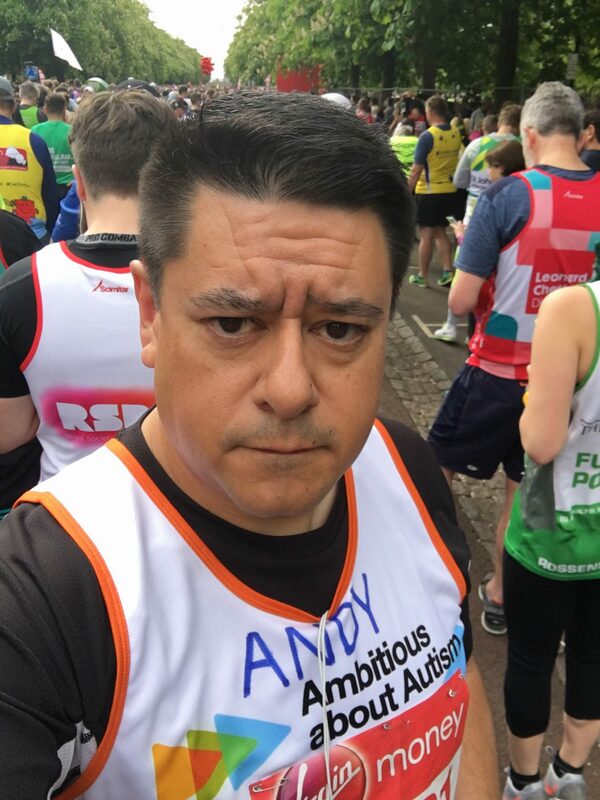 The real realisation (people had told me) that having my name on my charity shirt meant that people would cheer me on all along the way – amazingly boosting to hear one’s name shouted out. After the first one, I made a point of smiling and acknowledging the wishes, which got bigger cheers and smiles. After that I was smiling all the way around. The music: from brass bands to DJs outside pubs to absolute crazies running sound systems and MC’ing off of their balconies to steel bands to full-on dance setups running off of lorries. I’m normally plugged into my iPod when running – not on Sunday. Buxton Water – wow, so many water stations and although mindful of not over-hydrating, I did drink enough and was also stunned at the seas of discarded bottles after the water stations – litter laws to not apply on Marathon day. Jelly babies and lucozade – I had been warned off the jelly babies but after about 20 miles, man they taste good. Free Jelly babies and Haribos, brought along by well wishing members of the public for no other reason than them wanting to be involved. So kind. The cocktail of sweets and lucozade carrying me along nicely. Then the guy with a tray of Jaffa cakes at Lower Thames Street – rich, chocolatey, fruity Jaffa cakes. I told him what a dude he was and gave him a friendly squeeze of the arm. After all those strangers calling my name, actually seeing the lovely faces of people that I knew in the crowd and the emotion that brings. Ulrike Klinger, Ben Shires, the Ambitious About Autism team, Tracey from my building (we ran 5 miles together!) and finally in the last mile, Rich (he had just completed in just over 3 hours – legend), Lucy, Holly, Megan and friends. And then finally, the most welcome sight of all, Angela, Charlie, Max, Holly and Paul all going crazy just before Westminster Bridge – that was the best bit. Their gorgeous, happy, excited, sunburnt faces pushed me through that through last mile. And then the end, the last few hundred metres, after some walking we all break into a run at the end. Past the majestic edifices of Parliament, Buckingham Palace, along to the Mall. Medals, goody bags, free t-shirts, photos and more drinks. And then it was all over. I had arranged to meet Angela and the kids at a reception in Rathbone Street to be held by the charity but not many of us made it in the end as time was limited – so instead I got a cab to meet them outside the Dorchester which I thought was a good landmark to meet at plus Max would love the epic cars parked outside. After a buzzing chat with the cab driver, he let me off at the hotel to be met by the Doorman. “I’m sorry, I am only being dropped off here, I’m not staying here” I explained. “That’s okay Sir, with that medal you get special privileges” he said, making my head swell nicely. Then it all went a bit wrong. I sat down on a wall outside The Dorchester waiting for Angela and the kids and suddenly a wave of nausea, tingling arms and dizziness came over me like a tsunami. Had I not been sitting down, I would have collapsed there and then. The hypochondriac in me knew my number was up – I had hyponatremia for sure and was about to kick the bucket. I sat with my head in my hands for a while drifting in and out – a kind Spanish man asked me if I was okay. I could not respond too well. But really all I needed was some proper food – as Angela arrived, she force fed me an apple then I was okay. The lack of food, and fuel of Lucozade, jelly babies and adrenaline had taken its toll. Then despite predictions of beers and curry, all I really wanted was the most basic McChicken Sandwich with a chocolate shake – McDonalds on the A40 in Hayes was my saviour there. Magic. After that, onto home, a long hot bath, phone calls, coffee and a super deep, satisfied sleep. Would I do it again? You bet I would. Will I do it again? Yes I think so, but I’ll concentrate now on getting my shorter-distance times down, losing some more weight and spending time with the family – no more whole Sundays lost to training. And I think Angela is itching for a marathon now… let’s see. Lastly: a MASSIVE thanks to all of you who sponsored me all through this time. 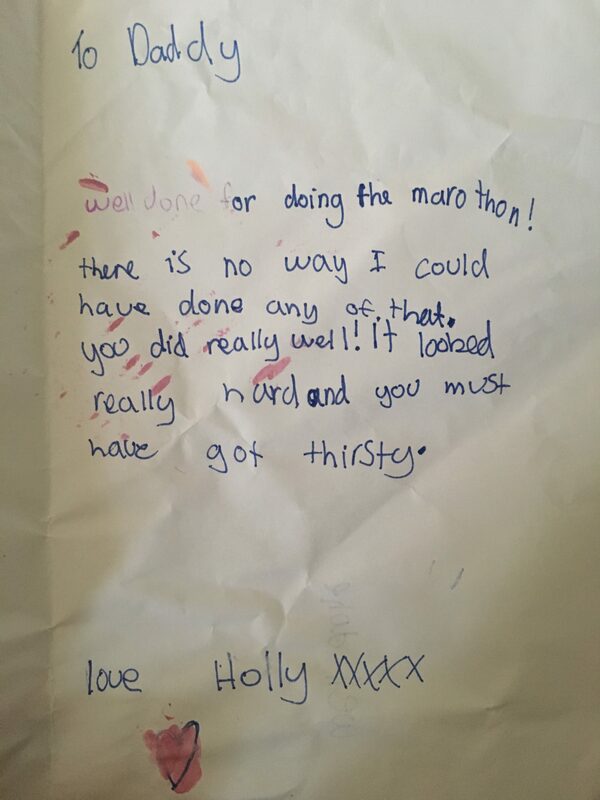 The sponsorship went mad in the week leading up to the Marathon with the money really just rolling in. 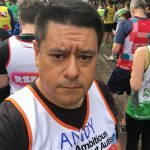 From September when I started this journey to now, with Gift Aid, my excellent charity Ambitious About Autism will benefit from nearly £5,000 in donations from me alone (I wonder if some of you can push it to just over the £5000 mark by doing one last little sponsor – click here if you dare 🙂 ….). Again THANK YOU all for your great sponsorship support. And THANK YOU to everyone who inspired me, believed in me, spurred me on, who let me go off on this wild journey and kept things afloat whilst I was neglecting the home and family (that’s basically Angela – love you) and THANK YOU for all the wonderful words of congratulations on facebook, strava, in the street and by other means – you all know who you are. Until next time, peace and love – keep running! 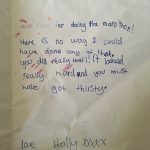 Proud of you – well done! Well done Andy! Not only the run, but also the entertaining blog! I’m choosing darts for my charity sport.